The organizers want to thank everyone who helped to make the 33rd Molecular Modelling Workshop 2019 an interesting and inspiring meeting! 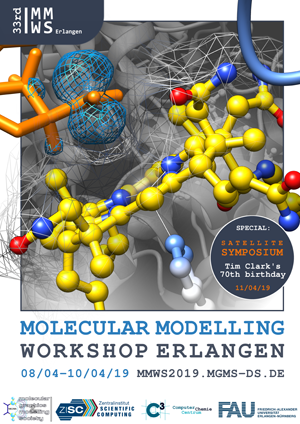 The 33rd Molecular Modeling Workshop 2019 (April 8th to 10th) in Erlangen provides research and graduate students, and new postdoctoral scientists with the perfect opportunity to present their research to the molecular modeling community. Scientists at the beginning of their academic career are able to meet new colleagues in academia and industry, discuss their research topics and gain valuable feedback. The aim of the Modeling Workshop is to introduce research in progress. It is the perfect venue to introduce new methods in molecular modeling that can be applied to many disciplines. The workshop is suitable for everyone, those who want to gain experience in presentation skills and those who just want to network in a friendly relaxed environment. 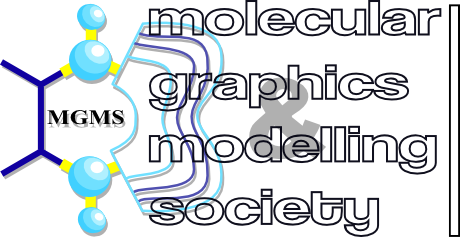 The organisers welcome both poster or lecture contributions in English from all areas of molecular modeling including life sciences, physical sciences, material sciences and the nano sciences, including computational biology and chemistry, and cheminformatics. This year, Prof. Dr. Paul Czodrowski (TU Dortmund) is responsible for the scientific content of the meeting. The conference fee amounts to 100 Euro (students and PhD students pay 50 Euro). If you do not disagree upon registration at the conference desk, the fee includes the annual membership fee for the MGMS-DS e.V. (only payment in cash at the registration desk is possible). Directly after the MMWS, there will be a one-day symposium on Thursday April 11th, 2019 to celebrate the occasion of Tim Clark's 70th birthday. You are invited to attend this meeting and extend your stay in Erlangen by an extra day. There will be invited lectures only and no contributed talks. There is no registration, conference desk, or extra fee. Nevertheless, we expect that you indicate your interest in attending on Thursday by checking the corresponding field during registration for the MMWS. General meeting of the MGMS-DS e.V. "The Role of Quantum Chemistry in the Development of Liquid Crystals for Display Applications"
"Structure-based design of riboswitch ligands and selective NMT inhibitors"
"Chemistry at the solid-liquid interface"
"Force fields for porous coordination polymers - a tricky business"
To give also the poster presenters the opportunity to have a look at the other presentations there will be two poster sessions. Several reasons have prompted us to introduce English as the official workshop language. (Oral presentations may still be given in German. However, please prepare slides in English in this case.) Oral presentations should not exceed 25 minutes (including discussion); posters should be prepared in portrait format (max. 90x140cm). The deadline for registration and submission of abstracts for oral and poster presentation is March 29th, 2019. Only online registration is possible. Please submit abstracts for oral and poster presentation (one page DIN A4 format) no later than March 29th by e-mail to mmws@mgms-ds.de. Please use this Word template or this OpenDocument template for abstract preparation and send it as PDF (print-ready) to mmws@mgms-ds.de. Please be aware that your accepted abstract document will be included as-is into the book of abstracts and on this website. Winner: 500 Euro plus a speaker slot option at the Young Modellers Forum in London, organized by the MGMS-UK. Only undergraduate, graduate and PhD research students, who agreed to our data publishing policy, qualify for the poster and lecture awards. After a successful first time last year, again Schrödinger is offering the pre-conference workshop "Structure-based Drug Design using the Schrödinger Suite"
Computational Chemistry has become an integral part of modern drug design. The methods in the computational modeller's toolkit vary enormously in cost and complexity, from simple visualisation tasks to high level QM calculations and atomistic dynamics simulation. Schrödinger, as a scientific leader in developing state-of-the-art chemical simulation software for use in pharmaceutical, biotechnology, and materials science research, offers tools spanning this entire range. The workshop is intended as a beginners overview of common modelling tasks. After a hands-on training in the Maestro 11 interface, the portal to all of Schrödinger's computational technology, the workshop will cover system preparation and general model building and will leave ample time for experimentation and questions. In this workshop you will learn how to use the Maestro 11 interface for visualization, basic modeling tasks, and to prepare proteins and ligands for running any down-stream computational applications. Building on this knowledge, we will use Maestro to look at a typical Glide ligand docking workflow, covering grid generation, docking, and the analysis. The workshop takes place 11 am - 1 pm at the Computer-Chemistry-Center, Nägelsbachstr. 25, 91052 Erlangen, which is in walking distance to the main conference venue (Fahrstr. 17). If you are interested in participating at the software session, please tick the corresponding checkmark upon filling the registration form. Please acknowledge that by checkmarking your interest you allow us to ask you by email to get in direct contact with Schrödinger to receive further information about the software session. We will NOT foward your email address to Schrödinger! Institute of Biochemistry, Fahrstr. 17. Participants must organize travelling and accommodation themselves. For a list of hotels and guest houses please follow the link (Hotels). The rates given are only for orientation and may vary. Wi-Fi access is possible by (SSID) eduroam. Please configure your Wi-Fi in advance or ask your local administrator for detailed informations about your eduroam access. The general meeting of the German Section of MGMS (MGMS-DS e.V.) will be held during the workshop. Note that you may easily join the MGMS-DS for one year and thus be allowed to attend the general meeting when you pay the registration fee at our conference site. For further information, and a list of abstracts already received, please visit this workshop website from time to time. Please address additional questions regarding the organization of the workshop to mmws@mgms-ds.de. We are looking forward to meeting you in Erlangen!